Foodguide is on its way to becoming the world’s largest Food & Travel community. The vision behind Foodguide is as clear as it is difficult: To always find the perfect food, the perfect drink or the perfect location for searching foodies! In order to achieve this goal, the Foodguide portfolio is growing steadily year after year. Started with a few hundred followers at Hamburgfoodguide on Instagram in 2014, the Foodguide family grew to over 90 accounts with more than 1,000,000 followers. The Foodguide app we developed to help you find the perfect match with you and a restaurant near you also has over 800,000 users worldwide to date. Since the beginning of 2018, the Tours button and the ‘Taste of’ boxes have been added, which are intended to create an even closer bond between restaurateurs and guests. 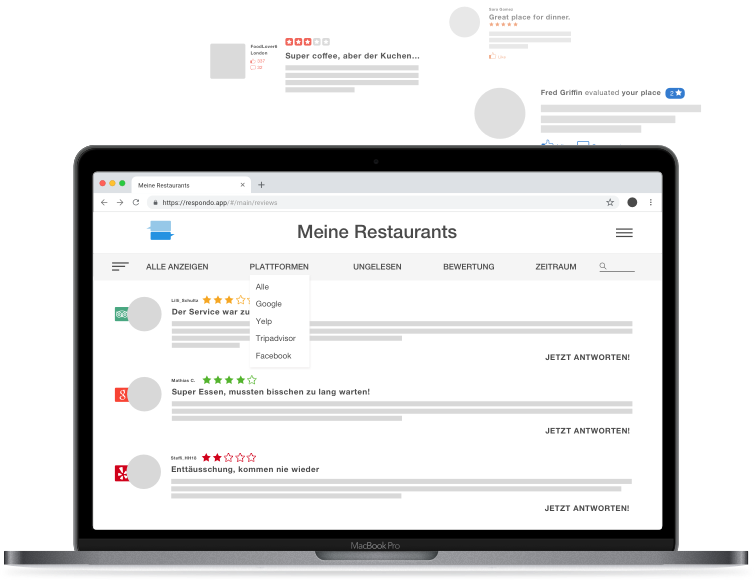 Last but not least, with Respondo, we have also developed a software for small and medium-sized restaurateurs that helps them manage their guests’ ratings. Fast and simple. With Taste Tours we take a multi-course meal to the Hamburg streets. For our guests we’ll take you on a food safari of a special kind: Let our guide take you to exciting gastro-pearls and discover the incredibly delicious diversity of our city! There are not only irresistible taste experiences for everyone, but you’ll also acquire insider information directly from the restaurateurs. Unsure if the Taste Tours is for you? But, of course! Joining in the fun is every kind of soul; Hamburg veterans, newcomers and passionate eaters. From paying the bill to reservations or marketing: Restaurants have arrived completely in the digital age. Just like their clientele: food is shared on Instagram, dating is via chat apps, and ratings are within seconds published online. With Respondo, you not only have the opportunity to respond to annoying tech fails and reviews upon reviews on all rating channels, but you can also view and compare the statistics of your own restaurant. Every city has so incredibly much to offer; whether it’s Hamburg’s nightlife district Reeperbahn, Cologne’s picturesque Domplatte, or in Berlin’s notorious meetup spot Kotti, everywhere offers endless possibilities for delicious restaurants. And lucky for you Foodguide is opening the gates to Foodie Heaven with: The “Tastes of Boxen”! The exclusive Coupon Box is your chance to feast on our highly recommended Gastronomy stops, bite by bite. 25 Hotspots- from well established Classics to emerging Newcomers- all waiting to be enjoyed and discovered by you. Have you already scoured all the restaurants in your area, or are you looking for the hippest restaurants in the city? Then the Foodguide App is perfect for you. Leave it to us to introduce the trendiest restaurants in your area plus you’ll even have the chance to upload pictures of your unforgettable foodie experiences into the App. From under the radar insider tips and exotic dishes to well-known classics that want to be rediscovered - the app makes every Foodie's heart beat faster! So c’mon, join our food community now. Digital influencers, new openings & PR events. In order not to lose presence in the digital world, something has to happen all the time. And that's exactly where we come in, from the blogger brunch to our own "Blind Dinner" format to the opening of Steffen Henssler's latest restaurant, the "Henssler Go", the Foodguide event team is perfectly prepared for every type of catering! We design and organise small and large events for selected customers from the Food & Beverage sector. We not only make use of our wealth of experience, but also open up our network of photographers, videographers, designers, architects, mobility partners and many other trades.